What are they up to these days? Some called it “good pr,” and some called it “a virus by the name of U2.” Whether Apple customers were angrily trying to remove it from their phones or happily rocking out, the world listened when U2 added their newest album to all Apple users’ iTunes library in 2014. 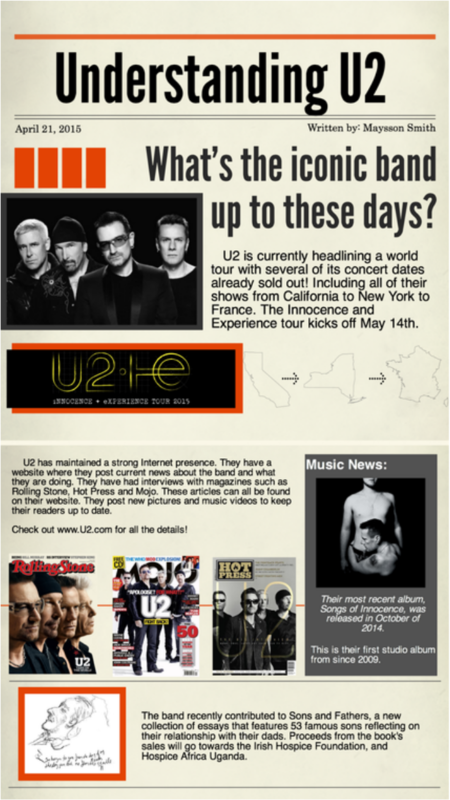 U2’s strategy may have sparked attention, but did the decision follow best practices in pr? Kent State Journalism and Mass Communications professor Stefanie Moore said the move skipped an essential pillar of public relations: knowledge of the target audience. So was the Apple invasion a good pr strategy? According to Moore, the answer lies in the need for transparency in the field. Topping off the lack of permission with such a dismissive (and sarcastic?) response was another way the pr move flopped. Although there were the inevitable iTunes users who appreciated or didn’t mind the new library addition, there are a few fundamental pr steps the band could’ve taken to make the strategy a true success. At the core of pr is the need to know who the target audience is. The fact that U2 even transitioned from Ireland to America must mean that the band has a significant fan base in the states. Doing an analysis of iTunes users to determine which of them had previously downloaded U2’s music (or similar band’s music) would’ve been a great way to target the audience with the album addition. This also would have created an opportunity for excited fans to share the news with their peers and potentially generate new fans. In pr, simply knowing the audience isn’t really enough; it is also important to know what they want. As an evaluation to U2’s initial analysis of the audience, the band should have listened online to determine the response coming from the target audience. This would have given them a chance to both respond to people on a personable level, and justify their actions for future pr strategies. As Moore mentioned, the fact that U2 neglected to get permission before implementing their strategy seemed to have made things more problematic for them. Even if the band wanted to hold on to the element of surprise, a statement or interview following the pr strategy detailing why they did it, I think, would’ve been well received. Moore’s point about having some type of opt-in/opt-out for the album could have made quite a difference for the band as well. Much of the anger and frustration directed towards U2 was not about the album being added, but about the fact that people didn’t know how to remove it. In the future, if musicians want to emulate similar strategies to spread awareness, looking to pr counsel should be the first step. What makes a campaign successful? Do advertising or public relations techniques that go into the campaign really matter, or is there something else even more important? Even in the 1980s, U2 knew that although listeners from The United States and Ireland spoke the same language, there were clear cultural differences that would have to be addressed in order to become a globally recognized band. How might a band go about creating a brand that feels personal to each country? We compared concert posters from Ireland and the US in the 80s to see just how we think this could be accomplished. Turmoil and emotions ran high in Ireland during the 80s because of the Northern Ireland conflict. As tensions between Unionists and Nationalists grew, violence and attacks on one another also began to peak. Even wearing a certain color in the wrong part of the country could be considered an invitation to fight, or worse, be killed. 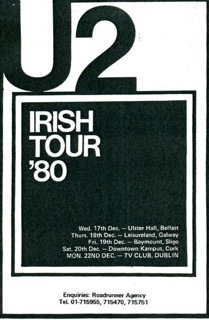 This is clearly reflected in the U2 Irish tour poster. The poster displays a modern yet simple design. Black and white are not considered bright or flamboyant colors, conveying how U2 is trying to appeal to everyone in Ireland instead of just Unionists or Nationalists. These toned down colors are used to branch out to a larger audience. The poster also uses a serif font, which is generally used with more modern groups of people and makes the poster easy to read quickly. The large black box that is in the center of the poster also reflects a style commonly used in the 80s when graphics and shapes were frequently displayed on TV or magazines. The 80s was a time filled with exciting new advancements for the US. Technology became central to the American way of life as the personal computer gained popularity. This new technology driven decade was also influenced by an increase in cellphone usage. A sense of nationalism also ran high as the Olympics were held on US soil for the first time in over 100 years. Similar to Ireland, color was also a significant factor when designing a poster. The color red dominates the background, signifying power and energy. This poster also has some prominent graphics that are representative of an 80s style. The serif font is similar to one used on computers from the 80s, drawing parallels to the technology-centered culture. The poster literally even says the word ‘computer’ in an attempt to connect with the audience. Bono is featured passionately singing in the center of the poster, which also helps to grab attention and personify the band to be more than just a name. Overall, this poster appeals to a much more loud and colorful crowd. 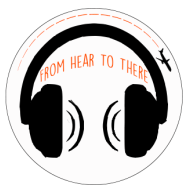 Check out our YouTube video on our See and Hear page! For more info check out our Prezi! "For us there's U2 music, and then there's everything else." "It is not enough to rage against the lie, You've got to replace it with the truth"
"Like I was telling Bono, we can't overrehearse. Otherwise, we won't make any mistakes and mistakes are a big part of what people love about U2." "Music can change the world because it can change the people"
"As a rock star, I have two instincts, I want to have fun, and I want to change the world. I have a chance to do both." "And you can dream, so dream out loud"
"Rock 'n' roll is ridiculous. It's absurd. In the past, U2 was trying to duck that. Now we're wrapping our arms around it and giving it a great big kiss." "Music expresses the inexpressible. All our songs are about that, about in articulation."